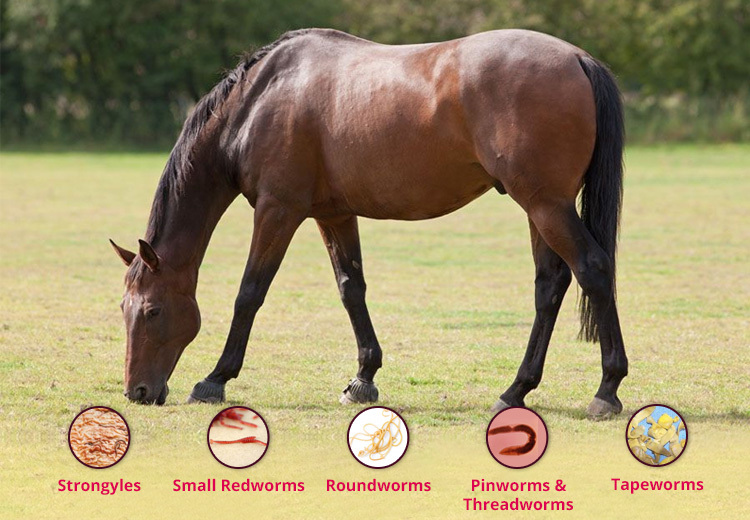 Worms not only have an impact on dogs and cats but also on horses. They can drastically effect the health of the horse that causes poor body condition, general ill health, and colic. These internal parasites can also damage the intestines of the equine, along with other internal organs. that can have a dangerous impact on the overall health of the horse. So, who are the usual suspects in horses that causes such a drastic impact on their bodies? These worms are extremely dangerous for equines which can lead to swift weight loss, colic and diarrhea. In some extreme cases, the horse can even lose his life. Strongyles comprising of large redworms and small redworms. These are the most dangerous internal parasites that can have a drastic effect on the health of the horse. The adult redworms eat the lining of the gut wall, which leads to momentous bleeding and damage. The larvae of large redworms cut through the gut wall into the bloodstream and migrate around the horse’s body to other organs, resulting in considerable damage. Due to this, blood clots and the blood vessel walls get weakened resulting in the bursting of arteries due to tremendous pressure which can have a dangerous predicament on the horse. These internal parasites can severely damage the gut of the horse, resulting in weight loss, colic, and diarrhea. They cut through the gut wall, thereby remaining there during the winter months before re-emerging in spring. When their numbers increase, it can have a drastic effect on the gut wall of the horse which can be extremely fatal. Also known as Ascarids, roundworms are specifically dangerous for foals. The roundworm larvae cause liver and lung damage coupled with lasting damage to the digestive system. When the worm numbers increase drastically, it can cause a blockage or injury of the gut which can be lethal for foals. Pinworms reside in the large intestine of the horse and can damage the bowel also resulting in severe itching around the tail. Due to these worms, the horse becomes distressed and rub his tail, which can cause open sores that can lead to infection. Threadworms found in the intestine are often dormant in adult horses but can transfer to a newborn foal through a mare’s milk. This makes the foal weak thereby affecting the overall growth of the newborn. Although tapeworms can cause less direct internal damage to the intestine of the horse, a large number can lead to a deadly blockage as they particularly tend to amass at the narrow site where small and large intestines join. It can even lead to digestive disturbances and colic. Bots are the larvae of flies, also known as horse bot flies that are common irritant to horses. Horse bot flies lay their eggs in the coat of the horse and as the horse grooms by licking, the eggs get ingested. After entering the mouth of the equine, the eggs hatch into larvae which get migrated to the stomach. If these worms are not treated on time, horses can suffer from inflammation in the throat and mouth along with ulceration of the stomach. Due to heavy burden of these parasites, horses can suffer from colic or even perforation of the stomach. Now, the important question is how to eliminate these worms from the body of horses? Right now in the market, there are lots of different Horse Worming Treatments available. But the important thing is to know when to commence the treatment. Since these worms and parasites are prevalent at different times of the year like grazing season and winter months, the worming schedule needs to take into consideration the types of worms to be treated. From November to February, treat the horse for encysted redworm using Panacur Equine Guard and bots with Eqvalan and Bimectin containing Ivermectin. During March, April, September, and October, treat the horses for tapeworms using Equimax, Eqvalan Duo. From May to August, treat the horses for roundworms and redworms using Panacur Equine Granules containing Fenbendazole. So, now that you are aware of the different worms affecting your horse, this is your chance to ensure that they are protected from these internal parasites by using appropriate de-worming treatments on a timely basis, as suggested in this write-up.